Meteora (in top photo) is the second most important group of monasteries in Greece (after Mount Athos), and is a UNESCO World Heritage Site. What makes Meteora unique is the fact that the monasteries are built on top of unique rock formations, making the monasteries appear to be located “sky-high”. These monasteries have a history that goes back to the 11th century, when a group of hermit monks first moved there. These monks wanted spiritual isolation and pure tranquility. Six Monasteries today are open for visitors, these are: the Holy Monastery of the Great Meteoron, the Holy Monastery of Varlaam, the Holy Monastery of Saint Stephen, the Holy Trinity Monastery, the Holy Monastery of Saint Nicolas Anapafsas and the Holy Monastery Roussanou/St. Barbara. 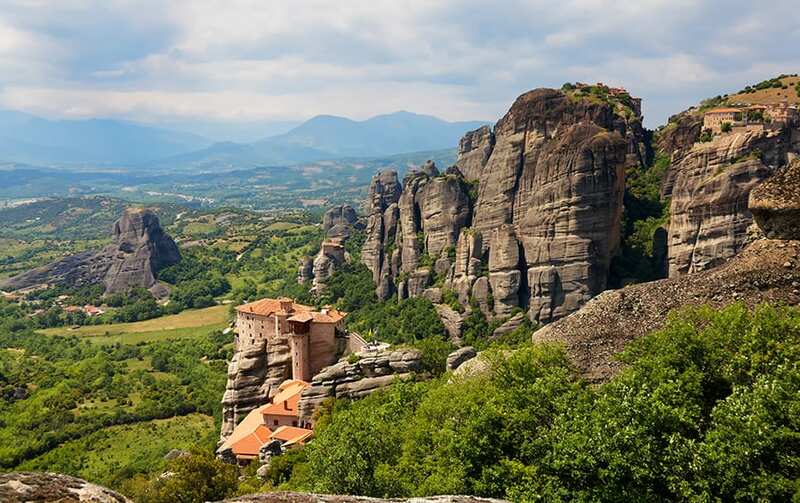 To discover this region, apply for the Meteora fam trip here. Pelion, also known as the mountain of Centaurs, is located in central Greece. It is unique in Greece in that it offers both proximity to the sea and the mountains. Pelion has 24 traditional villages, which have unique Pelion-style architecture. The town of Volos, with approximately 144,000 inhabitants, is coastal and is known for its tsipouradika—tavernas which serve meze and tsipouro. The Pelion region is famous for its lush vegetation, rich orchards with vegetables and fruits, and forests with streams running through it. This is a year-round destination that one can visit during all seasons, and activities such as hiking, horseback-riding, skiing, swimming, and even mushroom picking are popular. To discover this region, apply for the Pelion fam trip here. The Peloponnese is a vast region, which takes up most of the Southern part of Greece. It has a rich history and is home to archaeological sites and monuments from different historical periods. Of key importance in this region is the Mani peninsula, which located on the second (middle) leg of the Peloponnese. Mani is famous for its well-preserved medieval tower houses and fortresses. The medieval castle town of Monemvasia is one of the most impressive monuments in Greece. The city of Kalamata is a beautiful coastal town with the view of the Taygetos Mountains in the background and is famous for its olive oil. The Peloponnese is also famous for its wine-making, with a long tradition and is the largest such wine-making area in Greece. To discover this region, apply for the Peloponnese fam trip here. Thessaloniki is the second largest city in Greece. It is an urban center that possesses a large student population. The city is well-known for its festivals, and vibrant art and cultural events, as well as for being a food mecca—many argue that the best food in Greece can be found in Thessaloniki. The food highlights the city’s multiethnic history and there are a plethora of options available, from informal eateries to gourmet restaurants. Thessaloniki is European Youth Capital for 2014 and hosts the International Film Festival, which is the premier film festival in the Southeastern Europe region. Thessaloniki also has a variety of archaeological sites, as well as Byzantine and Ottoman monuments that are open to the public. To discover this region, apply for the Thessaloniki fam trip here. The deadline to apply for these FAM trips is Friday, September 19th, at midnight, Pacific Time. Our hosts in Athens advise that bloggers will be notified of their selection for the trips next week. Remember, you must be registered to be eligible to participate in a FAM trip, so if you’ve been putting it off, head on over to register today.